M.R. Everette is the author and illustrator of the Fibles Series of children's eBooks (the Adventure Series and the Learning Series). Fibles is pronounced (fib·els) which means an untruth. The new Adventure series is based around a kind and good-natured character named Beau Bear and his sensitive best friend and traveling companion Wheelburro. Along the way, Beau Bear and Wheelburro learn about the curse that that was put on the Great Red Forest and how it became known as the Bare Lands. Beau Bear and Wheelburro end up becoming unwitting participants in reversing the curse from the Bare Lands and back into the Great Red Forest. M.R. Everette is a graduate of Arizona State University’s school of business where he earned a Bachelor of Science Degree in Management. After completing his degree, he went on to become a marketing director, web designer, and author. In addition, he has also created an Indie publishing company called Cookietwist Publishing LLC. Have fun and read the Fibles Series of eBooks aloud! Beau Bear: The Fible of the Great Red Forest is an action and adventure storybook for children, grades k-3, written by M.R. Everette. On the Title Page, the author explains that a fible is “a story with an untruth.” Armed with that knowledge, the reader is invited to share in the adventures of Beau Bear and his trusty companion, Wheelburro, as they explore Big Bear Valley in the Bare Lands of Arigonia. Beau and Wheelburro could see nothing but sand, cliffs and rocks for as far as their eyes could see, but Beau knew that Big Bear Valley used to be a beautiful, fertile land with trees and plants. His grandfather, Red Bear, who he had never actually got to meet, used to live in Big Bear Valley, and he planted a redwood tree when he was just a child. Red Bear watched as the sapling grew into a big strong tree. According to Red Bear, the problem with the valley began when a small red fire-breathing dragon, named Dragonia, continually set fires in the forest. Her carelessness concerned the other animals, and eventually Dragonia was asked to leave. Angered by their decision, Dragonia promised that one day she would return and put a curse on Big Bear Valley. No one ever saw her return, and no one really knows exactly how the valley became so cold and barren. M.R. 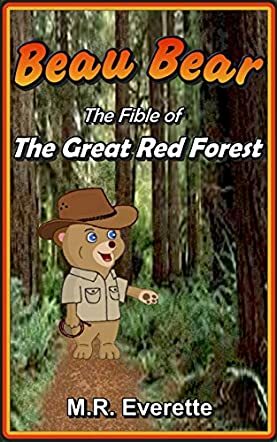 Everette’s whimsical adventure storybook for children, grades k-2, Beau Bear: The Fible of the Great Red Forest, is a fun tale about two brave adventurers who are looking for Red Bear’s favorite redwood tree. Desert-dwelling children will no doubt wonder, as I did, if the mythical land of Arigonia was not really Arizona, and that only adds to the pleasure as we follow Beau Bear and Wheelburro on their quest. Everette’s tale has a marvelous mythological feeling as the bear and the burro make friends with a ground squirrel, a tribe of chipmunks and a guardian weasel during their travels. This fible is an excellent selection for an exciting read-aloud session, but its descriptive illustrations and simple vocabulary make it suitable for advanced readers to try on their own as well. Beau Bear: The Fible of the Great Red Forest is most highly recommended.